Our disc replication service is the perfect solution for large orders of one thousand (1000) discs or more. 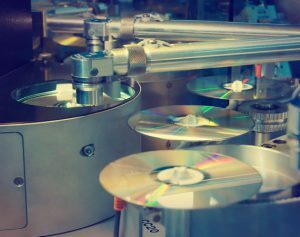 Disc replication is a more cost effective process when fulfilling bulk requests and provides a high quality, off-the-store-shelf high grade product. We manufacture all of our discs locally in Los Angeles using sophisticated, high-quality, high-speed equipment. All discs are created by matching the master byte-for-byte, followed by complete quality assurance testing to ensure 100% satisfaction.